Zoho Analytics allows you to manage your account and collaborate with your colleagues and users with a segregated workspace called Organization. The administrator of the organization can manage the subscription of his organization as well as the users who can access the account. How can I create an organization for myself? Will an organization be created automatically when I sign up for Zoho Analytics? How do I know if I am a part of an organization? How many Organizations can I own? How many Organizations can I be a part of? Who is an Administrator and what are the privileges of an admin? How do I find the administrator of the Organization that I am a part of? Can there be more than one administrator for an organization? How can I make an organization as default? What will happen if I select the "All Organizations" option? Can I add an existing Zoho Analytics user into my organization? How can I add a user to my Organization via the "Manage Users" tab? How can I remove a user from an organization? How can the users in my organization sign up for a Zoho Analytics account? How can I share the reports and dashboards to the members in my organization? What are the roles that can be associated with the users in my organization? How do I access databases in the organization? I am part of an organization, but I do not see any reports or dashboards. Why? How can I see all the Workspaces in my account? Why am I not able to create a Workspace in the Organization that I am a part of? How can I edit the settings of an organization? How do I manage the subscription of my Organization? If I buy a paid plan, will the users in my organization be able to utilize it? The administrator of my organization has purchased a paid plan. But my account is still in a free plan. Why? I am in an Organization and when I tried to manage the subscription I get an error message saying "Subscription not permitted". Why? I am in an Organization and when I tried to manage the settings I get an error message saying "Settings not permitted". Why? 1. What is an Organization? 2. How can I create an organization for myself? When you sign up for a Zoho Analytics account there are 2 possible cases. Case 1: You do not have any associated Organizations in Zoho Analytics before signing up. Case 2: You have already been added into an Organization before signing up for Zoho Analytics. Case 1: When you sign up for Zoho Analytics and your account has not been associated with any organizations previously then an organization for your account will be created. You can view this organization under My Organization section in the popup that opens upon clicking the Profile icon. To rename your organization, hover your mouse over the organization that is created and click Rename Organization. An Owned badge will be displayed next to Organization that you own. Case 2: In case you have been already added to an organization before signing up for Zoho Analytics, an organization for your account will not be created. Zoho Analytics, however, allows you to create your own Organization as well.You can check the Organization that you are a part of by clicking the Profile icon. The organization that you are a part of will be listed under the My Organizations section. Click the Profile icon in the top right corner. In the popup that opens, click "+" button. 3. Will an organization be created automatically when I sign up for Zoho Analytics? Please refer to the previous question to learn about Organization creation. 4. How do I know if I am a part of an organization? All the organizations that you are a part of will be listed under the My Organization section that opens upon clicking the Profile icon. If you own an Organization then an Owned badge will be displayed next to the organization. 5. How many Organizations can I own? Zoho Analytics allows you to own only One organization. But, you can be a part of any number of organizations. 6. How many Organizations can I be a part of? You can be a part of any number of organizations. 7. Who is an Administrator and what are the privileges of an admin? An Administrator is a person who owns the Zoho Analytics Organization and has the authority to perform all possible operations available. This includes creating a Workspace, creating reports/dashboards, managing users, sharing reports, managing subscription etc. 8. How do I find the administrator of the Organization that I am a part of? You can find the administrator of the organization that you are a part of by clicking the Profile icon. The email id of the administrator will be listed under the corresponding Organization name. 9. Can there be more than one administrator for an organization? No, there can be only One administrator for an Organization. 10. How can I make an organization as default? To set an Organization as default, click the Profile icon in the top right corner. In the popup that opens, hover your mouse over the Organization that you wish to set as default and click the Default icon. 11. What will happen if I select the "All Organizations" option? The All Organizations option will be available under the My Organization section that will pop up upon clicking the Profile icon. Selecting this option will display the all the Workspaces from all the organizations (owned and shared). The databases from your Organization will be listed under the My Databases tab and the databases that have been shared with you will be displayed under the Shared Databases tab. You can set All Organizations option as default by clicking the default icon that appears next to it. 1. 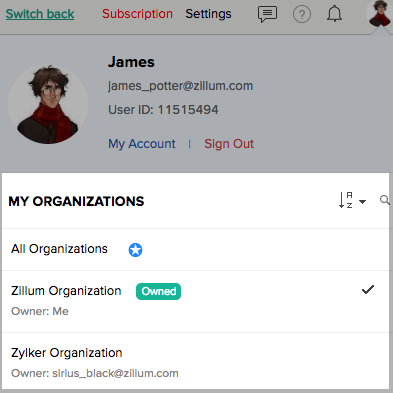 How do I add users to the organization that I own? 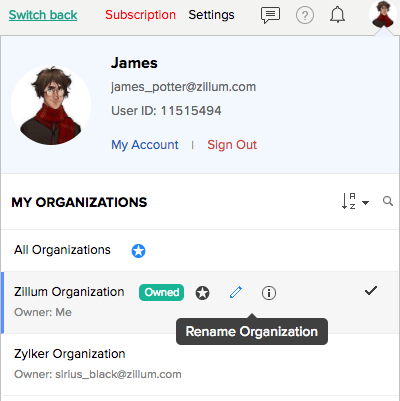 You can add a user to your organization by simply sharing a view or a Workspace with them or by adding a user directly to your account from the Manage Users tab. 2. Can I add an existing Zoho Analytics user into my organization? 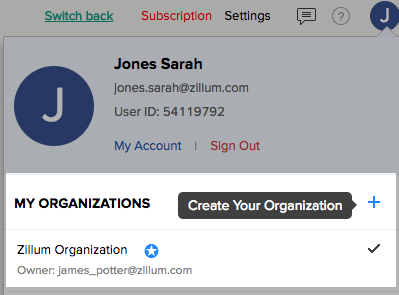 Yes, you can add an existing user to your organization by using the sharing options available with Zoho Analytics or by adding them directly to your account from the Manage Users tab. 3. How can I add a user to my Organization via the "Manage Users" tab? Click Settings link at the top right corner and then select Manage Users tab. Click Add New Users option. In Add New User dialog box that appears, you can add users by typing them or by selecting them from your Zoho/Google Contacts. Refer to this help section to learn more about adding a user. 4. How can I remove a user from an organization? 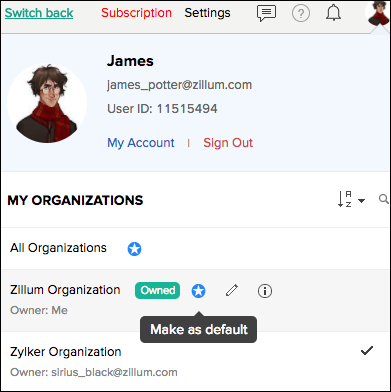 You can remove a user from your organization by deleting the user from your account. Click Settings link at the top and then select Manage users tab. Select the users you wish to delete. Refer to the following section to learn more about deleting a user. Please do note that this option will only delete the user from your Organization. It cannot be used to delete the Zoho Analytics account of the User. 5. How can the users in my organization sign up for a Zoho Analytics account? Users can sign up for Zoho Analytics by visiting the Zoho Analytics website. Please refer to this help section to know how a user can sign up for a Zoho Analytics account. If an existing Zoho Analytics user has been added to an organization, then he can simply sign in to Zoho Analytics to access the Workspace that is shared with him in the organization. 6. How can I share the reports and dashboards to the members in my organization? You can share the reports and dashboards to the members of your organization using the Share option. Please refer to the topic Sharing and Collaboration to learn more. 7. What are the roles that can be associated to the users of my organization? Zoho Analytics has 3 user roles - Administrator, Workspace Administrator and User. Click here to learn about user roles in detail. 1. How do I access databases in the organization? All the Organizations that you are a part of will be listed in the My Organization section that opens on clicking the Profile icon. Selecting the Organization will load all the Workspaces that is available for you in that Organization. 2. I am part of an Organization, but I do not see any reports or dashboards. Why? This can happen when an administrator has added you as a user into his account but has not shared any reports or dashboards with you. Kindly contact the administrator and ask him to share the necessary reports and dashboards with you. 3. How can I see all the Workspaces in my account? To view all the Workspaces that you have access to in your account, click the All Organizations option under the My Organization section that appears upon clicking the Profile option. The databases that you have created will be listed under the My Databases tab and the databases that are shared with you will be listed under the Shared Databases tab. 4. Why am I not able to create a Workspace in the Organization that I am a part of? You will be allowed to create a Workspace only if you are the administrator of that Organization. 5. How can I edit the settings of an organization? 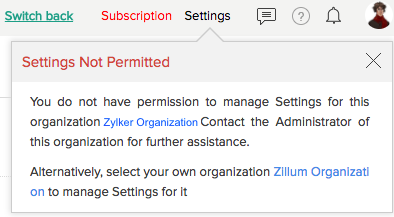 You will be allowed to only edit the settings of the organization that you are the administrator. Hover your mouse over the organization that is created and click Rename Organization. 1. How do I purchase a paid plan for my organization? You can purchase a paid plan for your organization by clicking the Subscription link from the Organization that you own (that you are the administrator of). Please refer to the following help link to learn more about the subscription. 2. How can I manage the subscription of my Organization account? 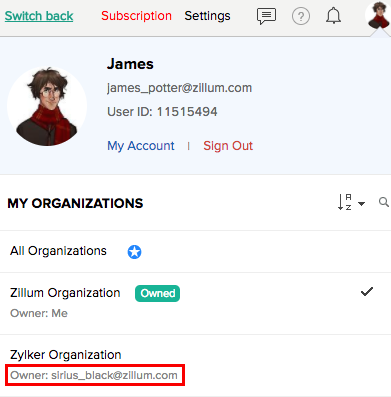 You can manage the subscription of your organization by clicking the Subscription link from the Organization that you own (that you are the administrator of). Please refer to the following help link to learn more about upgrading/downgrading your plan. 3. If I buy a paid plan, will the users in my Organization be able to utilize it? Yes, the users of your organization will be able to enjoy the benefits that you have granted to them as long as they are in your organization. Your subscription is associated only with your organization. Please refer to the following help section to learn about granting permissions. 4. The administrator of my Organization has purchased a paid plan. But my account is still in a free plan. Why? The subscription of an account is associated along with the organization. Therefore you will be able to enjoy the benefits of the paid plan as long as you are in the organization that has been shared to you by your administrator. If you have created a new Organization then the subscription of your Organization account will be applied to it. 5. I am in an Organization and when I tried to manage the subscription I got an error message saying "Subscription not permitted". Why? 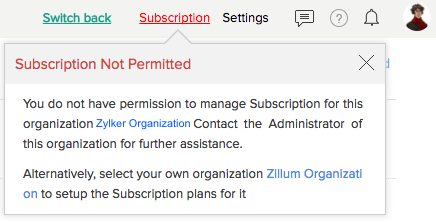 You can only manage the subscription of the Organization that you have created (you are the admin). This popup will appear when you are in an organization that has been shared to you. If you have your own Organization we request you to select it and then click the Subscription link. 6. I am in an Organization and when I tried to manage the settings I got an error message saying "Settings not permitted". Why? You can only manage the settings of the Organization that you have created. This pop up will appear when you are in an organization that has been shared with you. If you have your own Organization we request you to select the Organization and then click the Settings link.